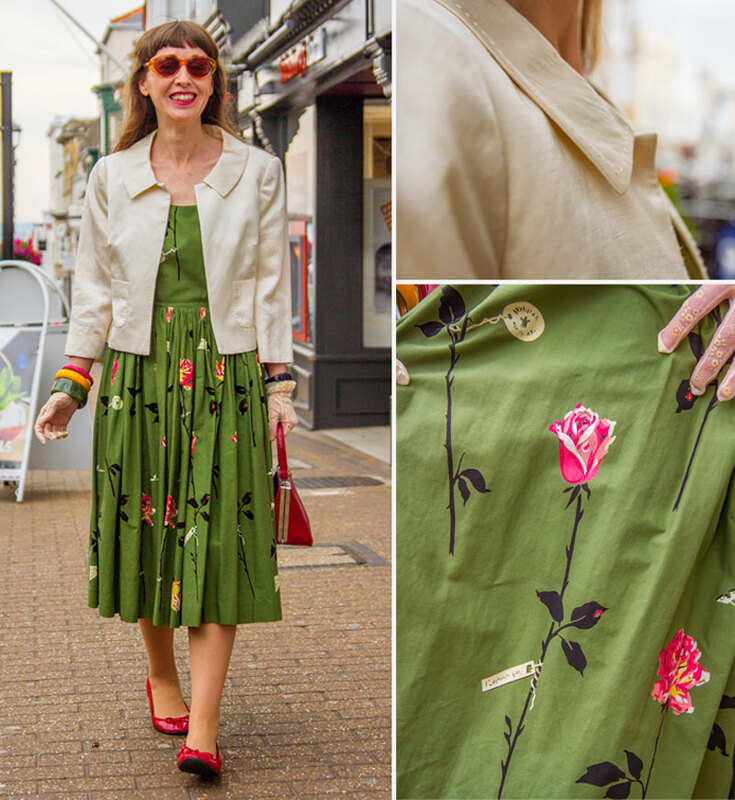 Sally has a fabulous curated style; blending vintage with charity shop finds. It turns out that we both trickled to the Isle of Wight from Portsmouth, love Pedro Almodovar films and catalogue our books and DVDs by the colour of their spines. We had a lot to talk about! 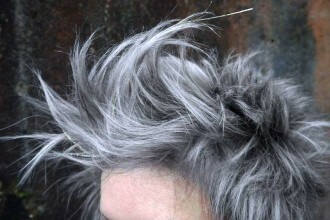 How would describe your look? Fifties and sixties; veering more towards French European sixties, rather a than Carnaby Street sixties. I’m heavily influenced by French new wave films. I’m a film historian, lecturing in film and media at Portsmouth University. My favourite film is Belle de Jour – everything Catherine Deneuve wears in that film I would like to have. It’s a 1950s dress; the material is very high quality. Its shape is “new look” – the big skirted-style is from when fabric came off the ration. I think it would’ve been very expensive when new. 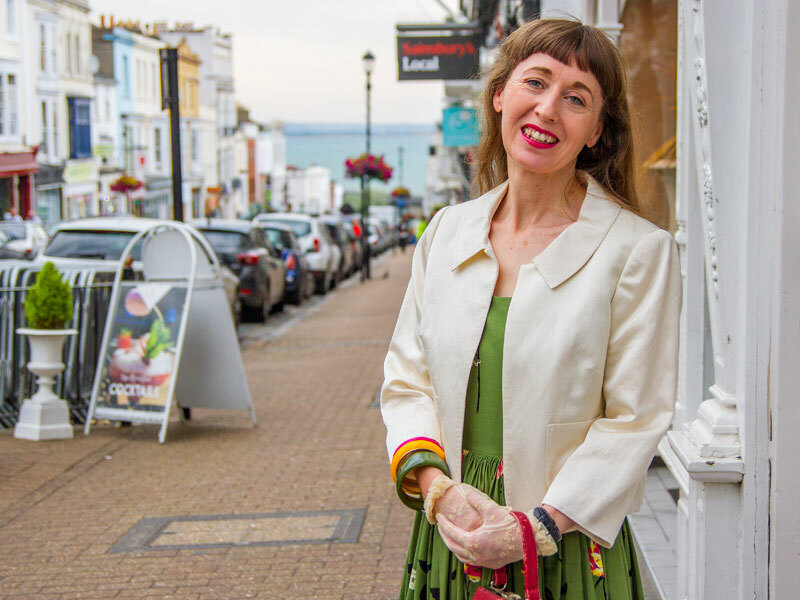 I bought it 25 years ago from One Legged Jockey in Southsea – about that time I really got into vintage. I love the way you’ve colour-matched your accessories. These red patent ballet pumps with cute bows are from the Red Cross shop in Ryde, £1.99. I love the shape of this green bangle. Although it’s a vintage Lucite style, it’s actually from H&M. 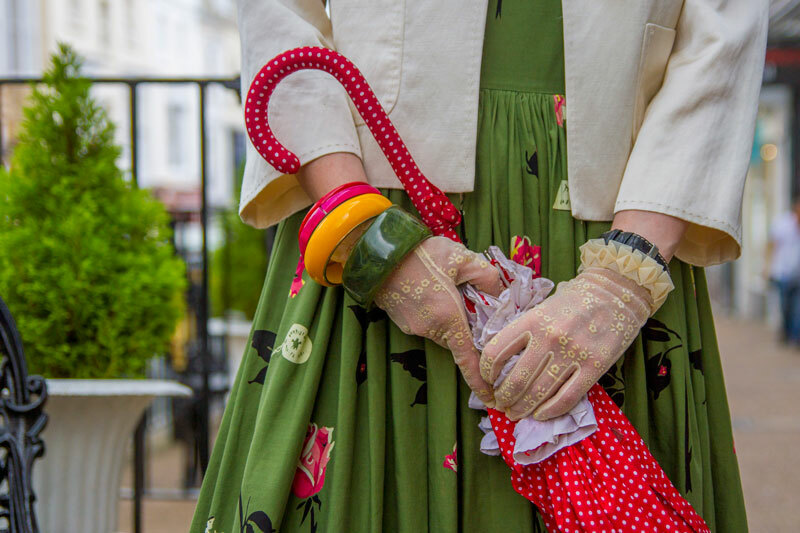 My other bangles are from the Earl Mountbatten Hospice shop and they all match colours in my dress. 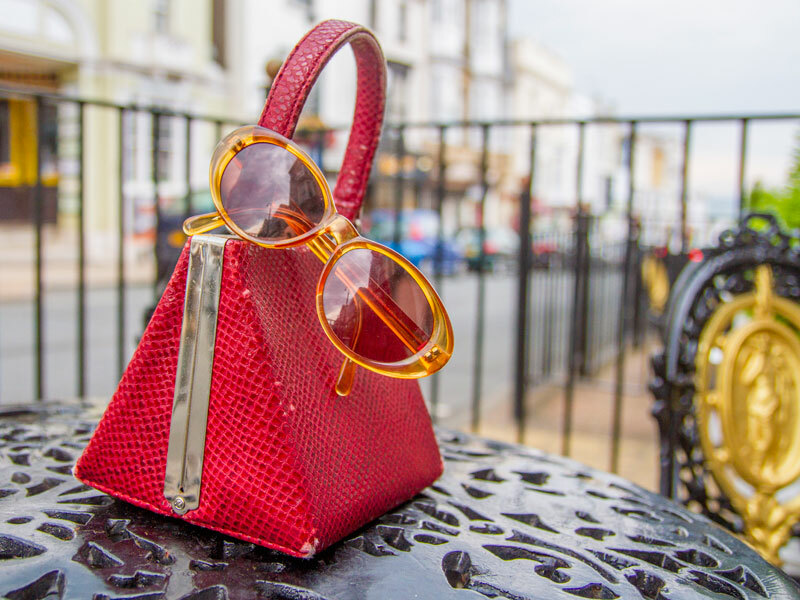 This red vintage clasp bag was bought for me about twenty years ago from Principals. Why do you particularly like vintage clothes? I work with lots of fashion students and there’s an ongoing debate about whether fashion can be ethical. There is an environmental impact to ‘fast fashion’. I keep my clothes for a long time, so my dress, for example, is truly vintage now! Despite the amount of material it’s nicely structured. If you wear fitted clothes it makes you stand straight, it cheers you up and cheers other people up. 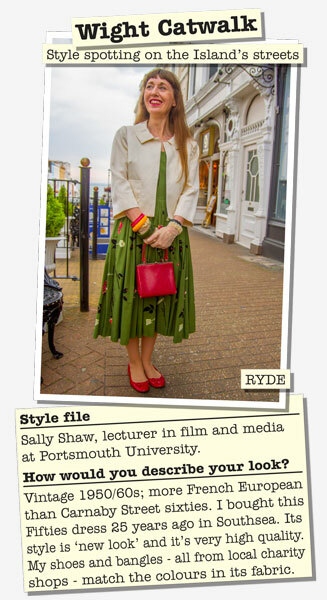 Sally Shaw featured as a Wight Catwalk street style spot in the Isle of Wight County Press. Photography by Steven Collins.